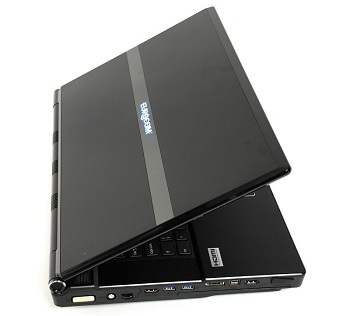 Eurocom Corporation (www.eurocom.com) announces support for Intel's new high performance 510 Series of Solid-State Drives inside their Mobile Workstations. The addition of the Intel 510 series of SSD's to Eurocoms extensive list of storage drives gives customers an even greater choice when customizing their purpose built systems. Customers have a myriad of choices between Hard Disk Drives, Solid State Drives and Hybrid Drives. Within the SSD segment MLC and SLC drives are offered. Intel Solid-State Drive 510 series accelerates SATA throughput by utilizing SATA 6 gigabits per second performance and NAND based SSD technology. The Intel 510 series supports data transfers up to 500 megabytes per second (MB/s), with sequential write times up to 315 MB/s. Intel Solid State Drive 510 series consists of 120GB and 250GB capacities. Eurocoms usage of NAND based SSD technology and SATA 6GB/s drives allow for super quick system responsiveness, boot times, application launches, file loads, sleep recovery and benchmarks. "The Intel 510 series SSDs gives Eurocom clients looking for the most powerful mobile workstations on the market a super fast storage option, that is rugged, efficient and performance oriented" explains Eurocom President Mark Bialic. The 510 series of Intel SSDs is optimized for the Sandy Bridge architecture, though the 510 series will add fast transfer rates to any model, the new line of Eurocom Sandy Bridge notebooks are optimized for maximum performance. These models consist of the EUROCOM Neptune and EUROCOM Racer. The 15.6" Racer and 17.3 Neptune are both based on the Intel Huron River HM65 and HM67 chipsets respectively, supports line of Intel Core i5 and i7 processors, up to 32GB DDR3 RAM via 4 sockets, can support up to 100W video cards which include: enthusiast cards AMD HD6970M, ATI Radeon Mobility HD5870, NVIDIA GTX460M, 470M, 480M, 485M and professional levels cards NVIDIA Quadro FX 2800M, 3800M, 500M. In terms of storage capacity, the EUROCOM Racer supports up to 2 storage drives, while the EUROCOM Neptune supports up to 3 storage drives. Due to their performance, quality and efficiency, Intel 510 Series Solid State Drive will help Eurocom customers moving to an Engineering on the Go, Server on the Go or RED Team framework. For more information on programs, such as the "Trade in Program", "Education Program", "Factory Outlet" and "Upgrade Center" or to customize a machine, visit Eurocom.com.